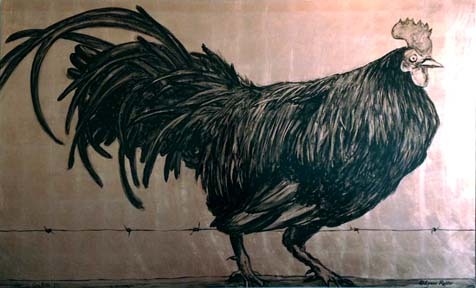 Sinopia is proud to introduce our June 2012 Artist of the Month: Lynne Rutter. Decorative artist Lynne Rutter is on a mission to wipe out plain white ceilings and rescue banal interiors with beauty, color, and a little bit of gold leaf here and there. 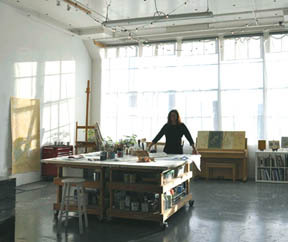 Lynne studied architecture and design at the University of California at Berkeley, graduating with a degree in fine art. 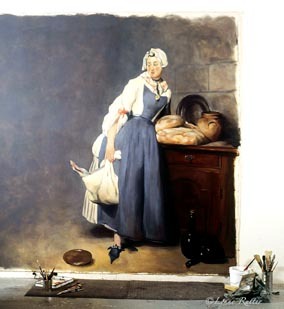 She furthered her training by working as a scenic artist, and by apprenticing with some of the leading decorative painters in the country, managing a large successful mural studio prior to founding her own business in 1990. 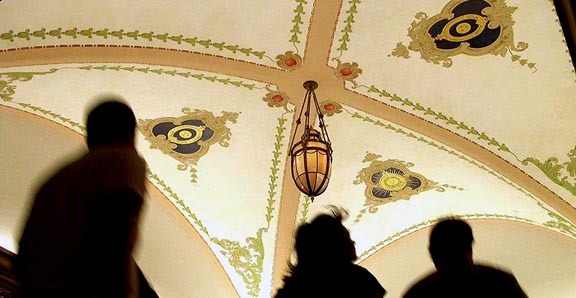 She has since become well-known for her ornamental ceilings, fine art murals, and a fearless use of color. I have something of an obsession with design, and love to work site-specific, designing for the whole wall or the entire space. To have made a career of this is rewarding beyond belief. Much of my inspiration comes from traveling, and from the great work of artists who came before me. I am attracted not only to the design of historic ornament but also the materials and techniques used, and have learned a great deal more about this doing restoration work. In my own work I use a lot of different media and techniques depending on the effect I want to achieve, and I have found these traditional methods not only fulfilling but also highly practical. oil on copper-gilt panel, 56" x 96"
When I started out I kept my fine art separate from my decorative work. But over time everything I did became inter-linked as part of a greater art practice. Painting gives me immense joy but also teaches me patience. Gilding is a discipline that takes incredible patience not just to learn, but to use well, and this patience I learned from oil painting. 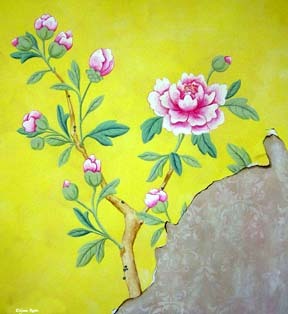 Developing color palettes for architecture is directly related to designing the color palette for a chinoiserie mural. I love work, the materials, the tools, the process. To me, it's all related. It's all about transformation and beauty.